A group of young men and women, on Sunday night, opened up a gap in the Israeli separation wall in Abu Dis, East Jerusalem, local sources reported. A group of activist youth managed to breach the wall for at least the second time in two weeks. According to PNN sources, clashes broke out between occupation forces and dozens of youth, after the activists broke through the wall. Palestinian youth threw stones and empty bottles at Israeli forces who fired live ammunition and tear gas and tear towards the citizens. 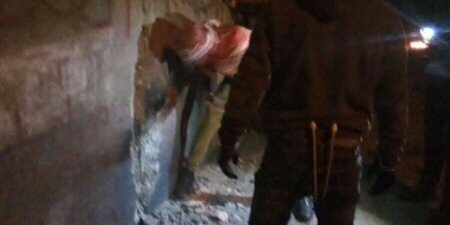 Tِen days ago, a group of young Palestinians also dug a hole through the wall in the same area of ​​Jerusalem, leading to the outbreak of clashes in the area, as well.